Jesse Gabrielle continues to be a revelation with Prince George out west. Boston’s fourth-round pick in 2015 is currently tied for the WHL lead in goals with 27 (in 42 games) with Jon Martin and Dryden Hunt, with seven of those goals coming in his last six games, and one goal in four of his last five. In addition to the scoring, Gabrielle makes his presence known by playing an aggressive, high-energy style. He’s not ready to be thought of as an NHL option in the next year or so, but it looks like the Bruins may have struck gold again out West one year after drafting BC native Danton Heinen in the same round in 2014. Speaking of Heinen, after posting about his down production earlier this week, he posted 1 goal and an assist in a Denver win over the University of Nebraska-Omaha. It was good to see him get off the schneid, because he’s such a smart and gifted player. 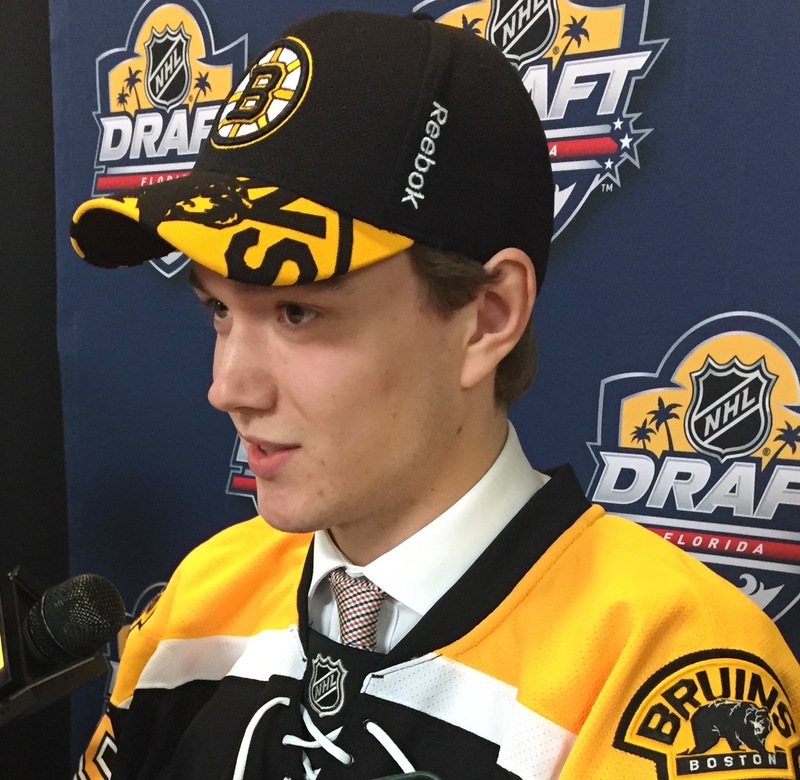 Going on the record right now in saying that three years from now, Heinen will be contributing in Boston and he’s got 50-point NHL potential in my view. Boston’s NCAA prospects went off this weekend: Ryan Fitzgerald had a four-point night Friday (1g, 3a) then added a helper the next night, but Saturday night was all right for scoring as Matt Grzelcyk potted a natural hat trick in BU’s trouncing of Mass. NU defenseman Matt Benning also got into the act, scoring a pair of goals to establish a new career-high for goals (and for the record- he went the entire 2014-15 season without finding the back of the net once). Also scoring goals Saturday night were: Jakob Forsbacka-Karlsson, Ryan Donato and Anders Bjork. In fact, when you factor in David Pastrnak’s second period goal against Ottawa, all of Boston’s 2014 draft picks save defenseman Emil Johansson (seventh round) tallied on the same night. Providence rolled this week, scoring 6 out of 6 points and getting superb play up front and in net from Malcolm Subban. He didn’t get credit on the stats line, but Koko was the only player to register a shootout goal Sunday against the Falcons, earning Providence its 9th consecutive home win. Good NHL tools here for the undrafted free agent out of the University of Minnesota-Duluth. If the B’s blue line depth takes a hit, he’s earned a recall at some point. Unfortunately for Casto, he’s the same type of defender that Boston has no shortage of, which works against him for obvious reason. He should win an award for best Twitter handle, though- “@FidelCrusto”scores major creativity points. The 2013 seventh-rounder posted his first two-goal game over the weekend but is still looking for a North American helper. Former Seattle Thunderbirds captain scored his first pro goal this past week. Subban had a tremendous outing Sunday against Springfield, stopping 41 pucks and surrendering just one goal in a 2-1 shootout win (he stopped all three Springfield shooters for good measure). Two goals this week and he’s already reached his entire 2014-15 goals output with 26 (in 27 fewer games). Spending a top-15 selection on this natural scorer and character kid now looks like a pretty forward-thinking (no pun intended) move for the Bruins. Has yet to get back into the Tri-City lineup since his standout performance for Team USA at the WJC, winning a bronze medal. After scoring a highlight reel goal against Sweden in the bronze medal game at the WJC, Bjork scored in both games/wins against WMU over the weekend. 1 goal and 4 points in 2 games since JFK returned from the WJC. One word to describe Grzelcyk’s weekend for BU after missing three weeks with a LBI: Wow! The 2012 third-rounder posted the first hat trick for a BU defenseman since 2003. Scored two goals in the bronze medal game against Sweden, and followed up with a goal in his second game back with Harvard.Steady as she goes is the mantra for the 2014 2nd-round pick. The 2016 World Junior (Under-20) Championship showcase is underway from Finland, as the tradition kicks off annually on the day after Christmas, better known in Canada and other parts of the world as Boxing Day. In a rare twist, USA took on Canada, normally a match in the 2-week tourney’s round robin round reserved for New Year’s Eve, scoring a solid 4-2 victory thanks in large part to the stellar goaltending of Carolina Hurricanes prospect Alex Nedeljkovic (2nd round- 37th overall in 2014) and some opportunistic scoring by USA after falling behind 1-0 in the second period. The Americans overcame an Alex DeBrincat spearing match penalty late in the opening frame that could have put them behind the 8-ball, killing the 5-minute period between the first and second periods. After Islanders 1st-rounder Mathew Barzal scored on a jailbreak play to give Canada the first lead, Senators prospect Colin White (Hanover, Massachusetts) answered for USA. Questionable power play chances yielded goals by both sides (Zach Werenski– Blue Jackets and Dylan Strome– Coyotes). With time winding down in a 2-2 game, a Louis Belpedio (Wild- third round in 2014) shot from the point was inadvertently deflected into the Canada net by Red Wings prospect (and undrafted free agent) D Joey Hicketts past his own netminder, Mason McDonald (Calgary- 2nd round 34th overall in 2014). 2016 NHL draft top candidate Auston Matthews got an insurance goal after a puck squeaked through McDonald and lay near the goal line for the easy tap-in to close out the scoring. In other games, Finland hammered Belarus (6-0), Russia beat the Czech Republic in a 2-1 shootout in a game where defense and the goaltending shined, while Sweden took vengeance against the Swiss by an 8-3 score but lost key players William Nylander (Leafs- 1st round, 8th overall in 2014) and Adrian Kempe (Kings- 1st round, 29th overall) to injuries. Swiss forward Chris Egli was suspended three games for his vicious blindside check to Nylander, knocking him out of the game with what is believed to be a concussion. The latest report has Sweden keeping him off skates for a ‘few days’ but hopeful the high-end forward can be back by the quarter final round. The Boston Bruins have seven players at the tournament, with GM Don Sweeney announcing Saturday between the first intermission of the team’s 6-3 loss to Buffalo at home that David Pastrnak is being released to play for the Czech Republic and will be available when the 28 December NHL holiday roster freeze is lifted. Defenseman Jeremy Lauzon was one of two final cuts for Team Canada. Watch for him, Zach Senyshyn, Jesse Gabrielle all to be staple players on Canada in 2017, when both are still eligible for the tournament. While good news for the Czech Republic and Pastrnak, this is a risky move for the Bruins in that they stand the most to lose should something happen to him over there to affect his availability for his NHL going forward. Too often, I think the WJC has gained an almost mythical status in the minds of hockey fans in this day and age- it’s a symbol of status that often drives opinions and perceptions of players both positively and negatively. Like some kind of video game, it seems that the more players a team has at the WJC, the bigger the bragging rights fans can claim, even though merely being a part of the carnival atmosphere is no guarantor of future NHL success. I get it- because of the prestige factor associated with the U20 WJC as the premier global showcase for the best hockey talent, many of whom have either already tasted the NHL or will be there soon, there is an expectation that if a player isn’t there, then that means something is wrong with them. Conversely, if a player is named to his country’s WJC roster, their status tends to get elevated, rightly or wrongly, and in turn, a player’s performance is often scrutinized and magnified in a way that either over-hypes them or leads to negative perceptions of their future NHL chances. What bothers me about Pastrnak going to the WJC is that he is coming off an injury that caused him to miss 24 NHL games after he took a hard shot off the skate and received a fractured foot (or “bone bruise” as reported). On the one hand- the B’s want to rehab him and the WJC provides a way to do that. It also exposes him to risk of either aggravation of the foot or possibly another injury. To those who have tweeted at me about the “safer” aspects of the larger ice surface and more skill/finesse at the WJC, go look at film on the Egli hit on Nylander yesterday in the Sweden-Swiss match and take note. Boston accepts all the risk here- Pastrnak is now playing games that won’t help the Bruins in the standings (nor would Providence, but the similar system would be beneficial to working him back into mental shape for the big club) but he’s also playing for coaches with different priorities/agendas than Claude Julien and Bruce Cassidy over in North America. Another argument I’ve heard is about how important the “experience” at the WJC will be for Pastrnak. Okay. Assuming that is the case, how is playing in his third WJC going to give him any more experience than he got when he appeared at the same tourney at age 17 and then again a year ago when Boston released him at 18? He played only about half a season in the AHL a year ago before going up to the NHL, so the argument that the talent and overall experience he’d get in the WJC vs. being in Providence at this stage of his career is certainly debatable. You can make good cases for each scenario, but the whole “He *needs* to be at the WJC to develop properly” is hogwash. Nor is it a matter of this being his only chance to skate for his country there- he’s already done it. Twice. And you can bet he’ll do it again, perhaps as soon as the Men’s World Championship, or at the next World Cup of Hockey. In the end- what I think doesn’t matter, because the Bruins made the decision to send him. I suspect they are acceding to his own wishes, and I get Pastrnak’s desire to play in the WJC versus going to the AHL with the chance to play for his country providing him with a compelling alternative. They might see the WJC as a better opportunity for him to get himself back on track after missing considerable time than riding the buses in Providence will. Perhaps the B’s feel that by doing this- they are acting in good faith and will only solidify their relationship with the player who by most accounts, is probably being groomed to one day replace Patrice Bergeron as the face of the franchise. It’s completely understandable. However, what do the Bruins get if something happens to Pastrnak in his 10-day stint overseas? The answer is- absolutely nothing…aside from blistering questions and second-guesses that will swiftly follow if the team suffers a setback with their prized asset in a game he didn’t really need to be playing, some 3,000 miles away from Boston. It’s all about risk management here, and the Bruins obviously feel it’s the right thing to do. So, we’ll cross our fingers and hope they are proven right. Anders Bjork, USA- One of the last cuts a year ago, Bjork is a top two-way forward at Notre Dame, known for his speed, hockey IQ and playmaking skills from the wing position. He played a typically solid game yesterday, showing off his effectiveness on the forecheck to deny Canada puck carriers time and space. He uses his speed to close quickly and has a quick stick to force turnovers or clog passing lanes with. He’s a highly confident, effective penalty killer- he leveraged his vision and instincts to be in the right place and prevent Canada from collapsing USA’s formations and exploiting the extended power play time on the DeBrincat major. You won’t see a great deal of offense from Bjork in the pros, but he’s the kind of player NHL clubs win with. Brandon Carlo, USA- He was beast yesterday defensively, using his 6-5 frame and long reach to repeatedly deny lanes to the American net all game long. Guys as big and mobile as the WHL veteran from Colorado is don’t grow on trees, and he played an effective game; making good decisions, maintaining his gaps effectively and electing the right times to play the body and puck. What I like about Carlo is that he doesn’t think he’s something he isn’t- he plays a refined, disciplined game positionally- not taking himself out of the play to score a big hit, nor pinching up in the offensive zone if a play isn’t there. He’s smooth and effective- he has all the tools to evolve into a very good shutdown defender at the NHL level in the not-too-distant future. Now for the bad news… While I recognize and respect his defensive acumen, I don’t see much in the way of consistent offense from Carlo that would lead me to believe he’s going to be a legitimate two-way threat at the NHL level. He’ll chip in with points on occasion, but his repeated missed shots from the point yesterday illustrate the kind of work he has yet to do on his game. I don’t see the vision or creativity once he’s in the offensive zone to be a real No. 1 defender at the highest level, but he’s only 19, so maybe that comes out in time. As far as the game against Canada goes- he played about as well defensively as you can ask, and that’s what matters most, as it translated into a key aspect of USA’s tone-setting win. I would only caution folks to slow the roll on the hype train and understand that he has the look of an NHL player for sure- but how much of an impact (I’m studiously avoiding the use of the term ‘upside’ in case you hadn’t noticed) he’ll have is still very much a question mark at this point. I’m not down on Carlo at all- he’s a great kid with a bright future. But for those who don’t see him but hear all these glowing reports about him- just trying to keep things in perspective. In Carlo’s case- I would be thrilled to have him wrong on this score, but when my 2016 Boston Bruins prospect ranking comes out in the New England Hockey Journal next week, you’ll understand why Carlo is not in my top-6. Ryan Donato, F- I’ll be brief. It was not a good look for the Dexter School prep star and Harvard freshman. He seemed to struggle with the pace and might have been a victim of nerves in his first-ever WJC game against an opponent like Canada. His ice time reflected that, as he didn’t get the regular shifts to work himself into a groove and when he was out there, he made some noticeable mistakes. Donato is an excellent prospect who often times pays a price for the perception of prep hockey and where it ranks in the developmental pecking order. A sensational season in 2013-14, and one in which I would have been fine with taking him at the end of the first round, saw him slip down to the end of the second. Even with that, I saw grumblings about him being drafted there, which I completely did not agree with. Conversely, getting Donato at 56 overall was a fine value pick for Boston if not one that will take time to develop and see the payoff for. Ted’s eldest son is a hockey savant- his offensive hockey sense and scoring instincts are second to none. He’s not a burner like his dad was, but he’s bigger and more physically gifted to skate in the modern NHL. He’s off to a fine start in Cambridge, a year after a down season at Dexter was then punctuated by a superb finish in the USHL with the Omaha Lancers. In other words- just as a lot of folks were eager to jump on Twitter yesterday to sing Carlo’s praises, there is absolutely no reason to pile on Donato for his subpar showing. It’s one game in one tournament. The thing to watch going forward with Donato is to see how coach Ron Wilson and the USA coaches use him and if he can settle in and find a way to do what he does best- bring offense. Given the role he had yesterday, however, that’s a tall order for any player. Daniel Vladar, G- Was a non-dress yesterday as Capitals prospect Vitek Vanecek (2nd round, 39th in 2014) got the start with Ales Stezka backing up. Vanecek played very well in a 2-1 shootout loss to Russia, so Vladar will likely have to wait for his chance to play if he even sees a sniff of action. His role will likely be to carry the mail in 2017 if he continues to progress in his development this season. Jakub Zboril, D- Boston’s top pick in June last just 10:17 into the contest when he was assessed a match penalty and ejected for boarding on a questionable hit that looked worse in real time than it was. He was given 25 minutes in penalties on the play, but no suspension is forthcoming. Jakob Forsbacka-Karlsson, F- The second-rounder scored Sweden’s sixth goal in an 8-3 rout at 12:50 of the second period. No scouting report notes as I did not see the game, but it’s a good sign for the BU center, who tends to be more of a passer/playmaker than a finisher. I will follow this blog post up later with some observations on some of the 2016 NHL draft hopefuls I saw in action yesterday. Like Dominic Tiano, Mark Staudinger is not just a friend but a knowledgeable hockey evaluator and it is my honor to bring you his insights to the Scouting Post, with his recap of Boston’s top two selections at the 2015 NHL Entry Draft and how they fared at this month’s Team Canada World Jr. summer camp in Calgary. Mark is one of two scouts who covers Western Canada for the Red Line Report and is one of the hardest working people I know. People seemed to enjoy the recent point/counterpoint feature I did with Dom on Zachary Senyshyn, so perhaps if Mark can find some time, we can engage in a similar debate with Jake DeBrusk, who in similar fashion, seems to have his share of critics because the B’s opted for him over Mathew Barzal. DeBrusk and Jakub Zboril haven’t even had an opportunity to show whether Boston’s faith in them was justified or misplaced. Barzal may in fact end up being a huge organizational mistake the way not drafting Logan Couture was for Boston in 2007. But for anyone to dress that kind of an argument and pure opinion/conjecture up as a fact in August of 2015 is, well, an exercise in futility. Why not read the opinions/insights of someone who was actually on hand to see them more recently? And again- the Canada camp and scrimmages that took place there are an extremely small sample size, so take this with a grain of salt. I’m sure those who are not fans of DeBrusk certainly will, as it paints him in a better light than some out there see it. 42 goals…at any level that’s an impressive number. You have to think the Bruins can use that kind of production if DeBrusk keeps bringing it. Jakub Zbořil: Offensive catalyst responsible for running the Czech Republic power play was played often early in both games, then amount of ice time tapered off as coaches were clearly evaluating other defenders. Obvious from puck drop that he will be the team’s top defender this Christmas, also no coincidence that the Czechs’ fortunes changed when he wasn’t seeing the ice as regularly later in games. Calm demeanor with an effortless stride, uses feet to get the puck into open ice. Easily the most surprising aspect of game was how aggressive physically he was all camp, showcasing great four-way mobility on the larger ice where most struggle to make open ice hits. Heavy snap shot nearly created a couple of great chances off rebounds, where teammates should have finished. Embraces role of triggerman, goalies have a hard time handling quick release shot which are even effective from up high along blueline. Used pinpoint passing to bail self out of trouble in own zone making extended feed hitting outlet in stride. Only major blemish was he let assignment sneak behind him backdoor in own zone for an uncontested goal, but doubt he lets that happen in many real game situations… something to monitor nonetheless. Jake DeBrusk: First time playing internationally at any age group he clearly was using this summer camp as a chance to adjust to the larger ice surface, appearing more comfortable as things progressed. DeBrusk is someone who relies heavily on understanding his angles to come off the sideboards quickly into traffic, a true winger he seemed to be slightly off at times where normally he stands out on the offensive zone cycle. One major positive aspect to take away is his skating really seemed to hold up on the larger ice getting through the bigger neutral zone with ease, using it to create multiple breakaways showing he can gain separation with quick acceleration alongside Canada’s best. Extreme late bloomer was supposedly 5’5” in Bantam, so most scouts out west believe he could receive a later than expected bump in play the next couple of years. Watching for that during camp, must say he seemed more balanced on his edges than last season staying centered over the puck with less wasted strides. Using this summer camp as a learning experience should more than satisfy the Hockey Canada brass, as long as he goes back to Swift Current and plays like he is capable of he has a decent chance of playing this Christmas in Helsinki. Jakub Zboril and Jake DeBrusk, the 13th and 14th overall selections in the 2015 NHL Entry Draft, faced off against one another last night as Team Canada took on the Czech Republic at the World Jr. Summer Development Camp in Calgary. The home team shelled the Czechs to the tune of a 7-1 score after the visitors tallied first- Brayden Point (surprise- another quality Tampa prospect) had a big night with a pair of goals and five points. Neither DeBrusk nor Zboril figured in any of the scoring. It’s not a bad time to go back and revisit the two players that the Bruins have a lot riding on. There are a couple of things that kept Zboril perhaps from not grading higher than a 20-something ranking. No. 1- he missed significant time last season to a knee injury, including missing the annual CHL Top Prospects Game. That in itself isn’t a huge concern, but the fact that his father lost a promising pro basketball career to wonky knees is certainly something to watch for. The other thing that is a little more troubling for me at least, and I saw this with him on film plus have been given similar reports from a couple of NHL scouting sources whose teams interviewed him…attitude. Let me be clear- no one is saying Zboril is a bad kid, but let’s just say that he doesn’t exactly set the ice on fire with his drive and hustle either. He rubbed at least one team official the wrong way at the scouting combine in Buffalo with his demeanor and answers in interviews. Maybe chalk that up to a bad fit between player and team, but Zboril has a lot to prove and high expectations to live up to. The Bruins cannot afford a talented player who shows up to Boston on cruise control, so how hard he works and applies himself will be a key observation point for me. Scoring winger constantly patrols the sideboards with purpose, driving sharply into edges making strong cuts to elude contact or head straight into contested areas. Great in transition, using good acceleration with a strong first step to take off in the neutral zone frequently driving past opposing defenses to get in alone on the goalie. Staggers perfectly, trailing a play to become an outlet for teammates, positioning himself to be in place for rebounds or second chance efforts. Strong on his stick in scoring areas, forces the puck towards the goal keeping feet churning through traffic. Zero hesitation; shot gets the puck off his blade promptly with pinpoint accuracy and strong torque coming off the stick. Offensive zone cycle game must continue to improve by learning how to work more set plays down low- it will create further sustained puck possession. So, can DeBrusk eventually make the NHL as a first- or second-line scoring winger? That’s the million dollar question, as DeBrusk was able to find a way to finish off plays in every conceivable fashion last season- in tight, from the outside, stick on the ice and flashing a quick release, or using his quick stick in close to deke goalies out of position. 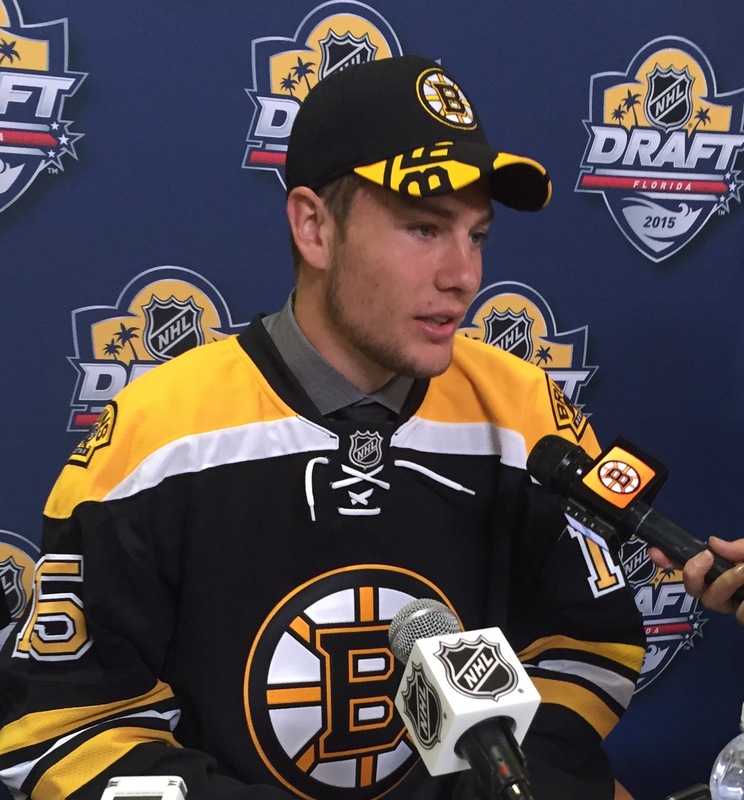 He scored a memorable goal on Zane McIntyre at Bruins development camp last month. But, there are lingering questions about the skating and the overall game with him. He’s on the average side when it comes to size and he lacks an explosive, dynamic element to his game. It seems that if DeBrusk isn’t scoring, he’s not doing much else to help and that’s going to be a major area for him to address in his development going forward. In short, he also has a lot to prove in the WHL this season- to show the Bruins that last season was no fluke and that they were right to pass on the more highly-touted (and ranked) Mathew Barzal and Kyle Connor to take him. Again- when it comes to rankings, Barzal and Connor were higher than DeBrusk on the public lists, but teams do things differently, and the B’s obviously didn’t see it the same way. DeBrusk made a comment at the draft that is important to keep in context, especially given the remarks about Zboril and his interview with a different NHL club. DeBrusk said that he got a “good vibe” from the Bruins and had an idea they were interested in him because his interview went so well with them; he said he had the Bruins in his top-three wish list after the interview. The same might hold true for Zboril- he might have felt so good about interactions with other teams that he just wasn’t feeling it with this other club whose scout I spoke to. We don’t know how many interviews he had done up to that point, or if he was just having a bad day in general. Food for thought. Anyway- in closing, DeBrusk and Zboril addressed clear needs for the Bruins- in terms of their offensive upside and potential to generate scoring chances. DeBrusk doesn’t quite have the ideal speed dynamic, but he makes up for it with a shifty elusiveness around the net and the hockey IQ/creativity to put the puck in the net. They are both quality prospects and for good reason- they, along with Zach Senyshyn, are going to be highly important to Boston’s fortunes if the Bruins are expected to get back on track in the next few years. No pressure or anything, guys. I’ll keep this short and pithy, but watched streams of the two exhibition games at Lake Placid yesterday between USA White-Finland and USA Blue-Sweden. Brandon Carlo, D USA White (Bruins)- Has the look of a modern prototype shutdown defenseman: big, fluid skater, positionally sound, tough to play against. He’s not a baggage-smasher type, but he uses his 6-5 frame and natural strength to knock opponents off the puck. I was also impressed with his confidence when handling the puck. He made quick outlets or grabbed it in the neutral zone and advanced it smartly up the ice. He’s not all that instinctive in the offensive end and doesn’t walk the blue line like top two-way defenders tend to, but he did have an assist on Sonny Milano’s second goal of the day. Keeper. Anders Bjork, RW USA White (Bruins)- He was rotating in with Ryan Hitchcock (Yale- undrafted) so he didn’t take a regular shift. I noticed him more on the PK, where he used his speed and quick stick to pressure the Finnish puck carrier and break it out the other way. He’s an effective forechecker and energy player. Scott Eansor, C USA White (Seattle Thunderbirds- eligible 2016)- Small ’96 from Colorado can really skate and hustle- he was buzzing all game and creating scoring chances, finding the back of the net once. Reminds me a little of Tyler Johnson back in 2010- undrafted little plucky kid from the WHL who got things done. It was one game, and he’s not an offensive dynamo in the WHL (14 goals, 37 points in 72 games) but I want to see more. Erik Foley, LW USA Blue (Jets)- No surprise here, but this is a player I have been high on for some time and he showed it on one particular play with fellow Bay Stater Colin White, when Sweden got sloppy on the PP and White forced a turnover, streaking up the left side. When the lone Swedish defender leaked over to his side, he then hit Foley in stride in the middle of the ice- Foley walked in alone and buried it for the shorthanded marker. Throughout the game, Foley did what he is known for- grind it out along the walls and help USA’s cause in puck possession. He’s a hard worker and his goal showed he has the hands/skills to match. Jets stole one. 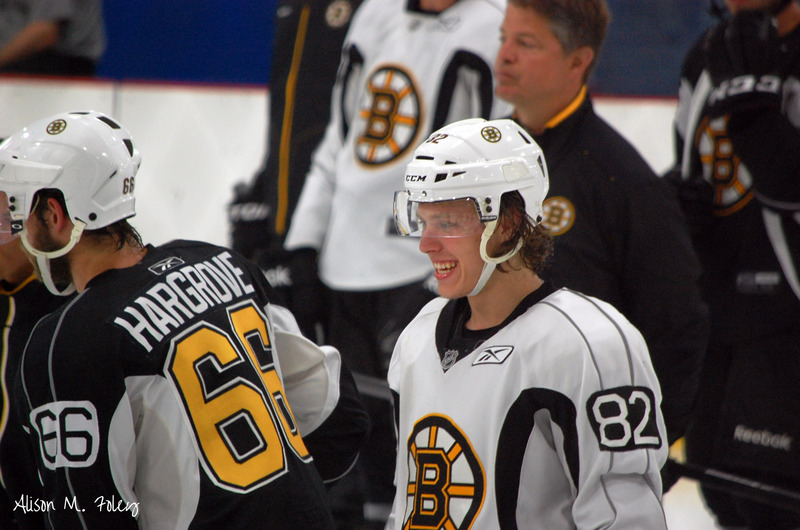 Jakob Forsbacka-Karlsson, C Sweden (Bruins)- It was a tale of two games for JFK, and not sure what happened. In the first two periods (especially the second) he was effective and energetic, making solid plays on both sides of the puck. He assisted on a second period tally by breaking up a USA chance in his own end and then transitioning the play from defense to offense with some shifty skating in the neutral zone followed by an on-target pass. In the third period, he saw his shifts reduced and didn’t accomplish much for the limited time out there. Don’t know if it was an injury or what, but it was curious. Conor Garland, RW USA White (Coyotes)- Typical game from the undersized but skilled agitator from Scituate. It didn’t make it into the final copy of the 2015 Red Line Report draft guide, but here is what I submitted for him as an award nomination for pest/toughest player to play against- He’s like the mutant baddies in the new Mad Max movie- relentless, just keeps coming at you with the quick stick and the yapping until the puck’s in your net or you blow up, whichever comes first. Chad Krys, D USA White (Eligible 2016)- Impressive game from the Nutmeg Stater and BU recruit- he skates very well and was poised, confident with the puck. He was effective on the point, getting shots through on net and it was his point drive that Eansor capitalized on in the 2nd period. Like many young players, he needs to guard against trying to do too much at times- he allowed a couple of turnovers because he didn’t make the smart, simple play, but he looked like a top-30 pick in this game and is someone to watch at the NTDP this year. Auston Matthews, C USA White (Eligible 2016)- The pure skill and talent jumps out at you. It wasn’t a dominant performance by Matthews and he reminded me a little of Jack Eichel last year on a few shifts in that he seemed to be revved up and trying to do it all himself. He’s got that long, fluid stride and anticipates the play so well, often getting the jump on a defender because he has that elite vision and sense for where the puck is going. Sonny Milano, RW USA White (Blue Jackets)- He put a stamp on the game with his first goal to tie it up- streaking in alone and putting a series of moves on the Finnish netminder before closing out the play. He then tallied again in the final frame on another jailbreak play, beating the Finns with his speed and flashing his lightning release. Jesse Puljujärvi, RW Finland (Eligible 2016)- Currently projected as a top-5 candidate next June, this wasn’t a great showing for the big Finn. He did assist on Patrik Laine’s goal to open the scoring, but was largely ineffective in terms of sustaining offensive pressure or making the kinds of plays you would expect of someone with his talent. He showed it in flashes- on one shift late in the game, he took the puck off the faceoff and bulled his way through 2 USA defenders only to have the puck knocked off his stick before he could shoot. It was only one game- the ability is there. Looks like one of those big horses who can take control of the flow on one shift, but it didn’t happen yesterday. Alex Tuch, RW USA Blue (Wild)- Snarly, effective game from the skilled New York and BC power winger. Milano and Tuch were their state’s first two players off the board in 2014 and they showed why yesterday with pretty disparate styles. Tuch’s team was on the receiving end of a loss, but he created space for himself and his linemates and stood out, especially in the second period.